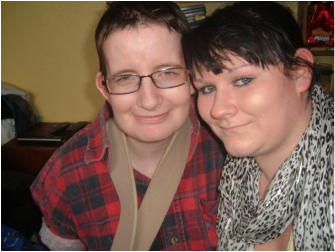 Cherylee Houston (Wheelchair bound Corrie actress) suffers from EDS3. See: http://tinyurl.com/32dvnjd. Ehlers Danlos comes in various types. I have type 3, the most common. Ehlers Danlos sufferers are often referred to as 'Medical Zebras', 'Zebras' (scroll down for further info on the Zebra aspect) or 'Genetic Mutants'. No 2 Zebra's have exactly the same stripes, every EDS sufferer presents with different aches/pains/dislocations/sores etc. EDS can be/is sometimes fatal, particularly type 4 Vascular EDS. As in type 4, more internal organs are affected. Some sufferers suffer complications from surgeries & sadly there have been a few suicides due to EDS pain (See: Former Model - Graphic Designer). It's always extremely sad when a fellow Zebra passes. The Zebra community is STRONG, VERY FRIENDLY & VERY SUPPORTIVE. WE ARE ZEBRA STRONG. YOU WILL WANT TO GIVE UP AT TIMES - DON'T. We ARE literally falling apart due to EDS. It's an awful lot of 'Chronic Pain & Fatigue' etc.... 24/7. The pain is IMENSE, never ending. I may walk un-aided/with a walking stick/with crutches/use a wheelchair etc. It all depends on the type of day I'm having. I currently rely on a single crutch when out & about. I need it, as my hips, knees & ankles are a MAJOR problem. I can no longer do a 'normal trip' down town & back without extreme difficulty. I don't yet have a wheelchair. 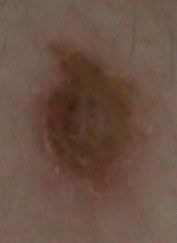 I get MULTIPLE sores, septic sores/scratches etc.... daily. 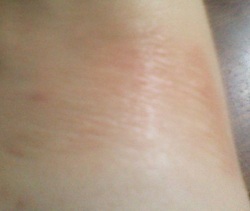 Most (99% cause scars). GP's/Physio quite often don't know much about EDS. It can be VERY hard to find a Proffessional that actually knows of the condition. My Physio 'trigged' to my extended range of motion in the arms etc... She started my whole diagnosis. It results in multiple scars, skin tears, sores, strecthy skin, bruises, poor wound healing (widened wounds), vision problems etc..... The list of what EDS can affect is literally endless. 80% of the eye can, is affected. As 80% of the eye is collagen based (whites of the eyes/shape of the eyes aka Astigmatism). Most sufferers will have major eye/vision problems. Surgery/having stitches/recovery time etc will also be much more of a problem. The ONLY good thing about suffering from EDS is that you do tend to look young for your age. Though that can sometimes be a little annoying. I still occasionally get asked to prove I'm over 18. Ehlers Danlos is a genetic condition that your born with. It is sometimes just sooooooo hard to hold down any job, you get used to hiding it to a certain extent, to work through the pain. With previous jobs I always had a DEA (Disability Employment Advisor etc, though I wasn't diagnosed with EDS at that point), this did help a great deal when it came to job interviews etc. EDS is caused by a faulty Gene, the one to do with collagen formation. Collagen is the glue that keeps joints/muscles/tendons/arteries etc together. Collagen makes up about 80% of the human body and 80% of the eyes. That Gene in sufferers doesn't form collagen properly, or at all. This results in MANY problems, as it affects joints, muscles, tendons, eyes, arteries & ligaments etc. I struggle to even lift/cuddle my Brother's (Dave) Miniture Schnauzer, Jazz. For me she IS a 'Mini Tank'. That is my own nickname for Jazz. After just a short period of playing with Jazz I get TOTALLY worn out. I'm in 'MAJOR BAD' pain. "There are numerous dental problems that may occur; cross-bite, narrow palate, cysts, peg, discolored teeth, jaw pain and clicking, periodontal, and many need braces (i.e orthodontics)". (I had fixed braces for 2 years, 2 months + to fix a 7mm overbite, I've now had retainers for some time. I'm now just using retainers, mostly on lowers (due to permanent retainer on uppers) at night (July 2011)). "Hypermobility of the joints of the bones in the middle ear creates problems with effective sound conduction across the middle ear. This loss of energy in route to the inner ear leads to a mild to moderate conductive hearing loss. Because the inner ear is also responsible for balance, improper function leaves some affected with bouts of dizziness. Problems with speech can occur; articulation, swallowing, hoarseness/weak voice, fluency". "All patients should see a geneticist to determine the specific type of EDS that they have, but patients considering pregnancy must receive genetic counseling so that they can make informed decisions. In addition to concern about passing EDS on to a child, a woman with EDS has an increased risk of miscarriage, premature rupture of membranes, premature births, cervical incompetence, and pre-mature labor". "Sleep complaints are frequently reported by patients with Marfan and Ehlers Danlos syndrome (EDS)". "Fragile soft velvet-like skin, some may have stretchy skin (hyperextensibility), or very doughy skin, and/or some have thin skin which shows the underlying blood vessels. 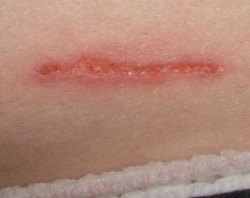 Fragile skin that tears and easy bruising can be mild to severe, some individuals have the characteristic "cigarette paper" scars, slow healing can be a problem, severe scarring; slow and poor wound healing; development of molluscoid pseudotumors (fleshy lesions associated with scars over pressure areas)". "Joint hypermobility; loose/unstable joints which are prone to frequent dislocations and/or subluxations; joint pain; hyperextensible joints (they move beyond the joint's normal range); shoulders, spine, elbows, wrists, knees, ankles, and laxity in the hands and fingers. and early onset of osteoarthritis". Ehlers Danlos Syndrome is an invisible illness, which means that the patient looks healthy even when symptoms are at their worst. Diagnosis tends to happen in your 20's to 30's. I was diagnosed 11th December 2009, at 31 years old. While getting it finally diagnosed is great, it's also real depressing as you know things will only get worse. There is currently no cure for EDS. Type 4 EDS is the Vascular type and can/does prove to be be fatal. I was born on the 13th November 1978. There has always been debate as to how premature I was. Sometimes it's 2 weeks+, other times it's just 2-3 days (not premature). I was always small. I always had eating problems, especially as I got older & developed a 7mm overbite. I would always struggle to eat normally, sometimes being sick straight after. Up to the age of 16 I was going to Hospital & Clinic appointments for: bone age was a few years behind/dental (I had a removable brace as a kid)/my knees were always a problem/I had to have loads of blood tests all the time/height problems/weight problems etc..... While I was at senior school I went on a work placement at an infant school. I ended up just being there for 3 days, as opposed to the 2 weeks. During those 3 days the kids would want me to play with them in the playground. They would pull me by the arms. At night my right shoulder dislocated for the first time. It was agony. Because it was in the early hours I struggled to get it back in place myself. 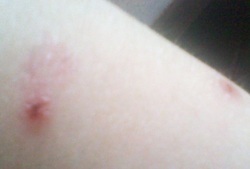 I could literally only move my arm millimeters at a time, because of the pain. I eventually got it into a more 'normal' position. I then maneuvered it into place & heard the 'click' of it going back in place, it hurt like hell. I then found an old sling I had. Parents obviously found out about it a few hours later. My parents & I went to my senior school & 'had a chat' with my tutor etc... It was agreed that I would spend the rest of the time helping my tutor out back at school. My tutor & I did not get along. I still got a certificate to say I did the full 2 weeks. Around the age of 16 Dr's etc.. couldn't really work out what more to do, so I was 'signed off' from everything. When I finished school I went to college for a few years. I then had a few part time type jobs, became unemployed. I would then go to Kettering Job Search type 'clubs' via bus. 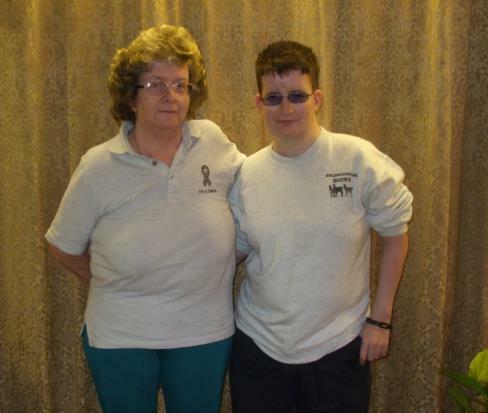 Because of my knee & shoulder problems I was assigned a DEA (Disability Employment Advisor) through the Job Center. I was then, for a few years able to work in Wellingborough. I had regular reviews at work, with my DEA there. Insurance company I was working for (at the time) was always happy & decided to take me on full time. 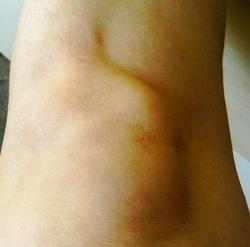 After a while my knees were becoming more problematic & I wasn't as able to walk to & from the bus stop. Luckily I found a great taxi driver, Tony. He agreed that he would take me in to work & bring me home every day for a reduced amount each way. I worked there for about 18 months. I left due to various reasons. For the next few years I was once again unemployed & claiming JSA. I then got a tutor job at a local PC Training Center. I'd been there before as a student & I already knew the boss etc... During the time that I was working there, my walking became much more difficult & painful. It was normally a 10 minute walk max to or from work. It ended up taking more like 30 minutes each way, as I had to keep stopping due to the pain. I had to use a walking stick to get around. At the time I was also setting up my own home business, Cyberward PC's (PC Tuition for the Elderly in Rushden). During this time a colleague (Monique) asked if I knew about Reiki. I hadn't heard of it before. I had a free sample session. After session I was able to ditch walking stick & run from one end of the building to the other (when boss called me in to her office). For a while Monique also became my Reiki practitioner. 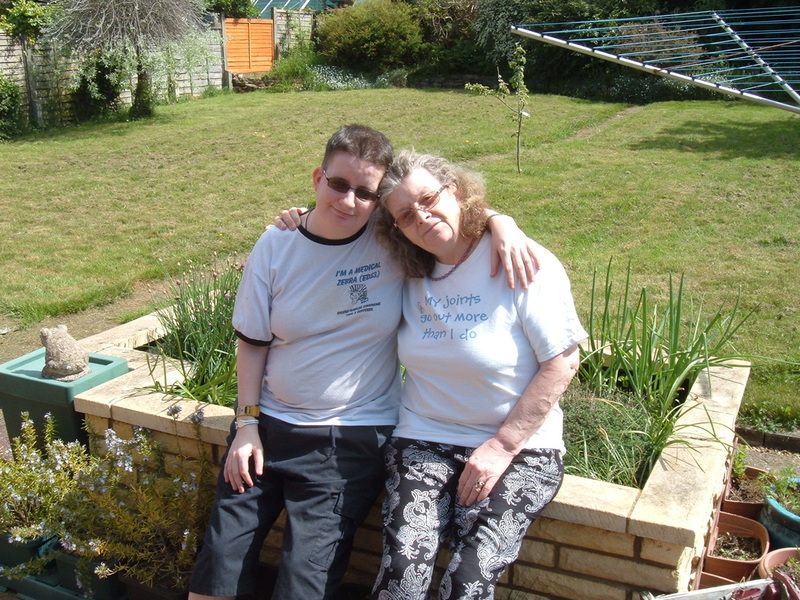 Mum also had a session & found it helped her. Monique then would work on both of us. Dad also had a free sample session & found it helped. I then went online & after some searching I found Master Lee. He was offering attunements to level 3 for free, for a short period. Mum & I both were attuned to Usui Reiki Level 3 by Master Lee. I have since been attuned to all 18 Usui Reiki Levels. 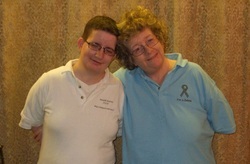 I have gotten big time in to Reiki, visit: www.lyndacward.com or www.cyberward.org.uk or http://reiki30.weebly.com. While working at the PC Training Center the student's became less & less. Eventually the center in Rushden closed down. I couldn't go in as much for some time due to walking difficulties kicking in again. I went full time in to running my home based business (the industry in Rushden is dead at the moment) & I'd been getting further involved with Reiki. My pain was getting worse & walking got increasingly more difficult. My shoulder(s) continued to dislocate. My left shoulder has dropped out twice. My right shoulder has dislocated over 15 times, I've lost count. 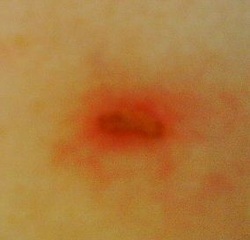 I did have to go Hospital twice due to my right shoulder, as I couldn't get it back in place anymore. As a result of the 1st Hospital trip I had to go to Physio at Rushden Hospital for a while. While I was there, my Physio noticed my extended range of movement. 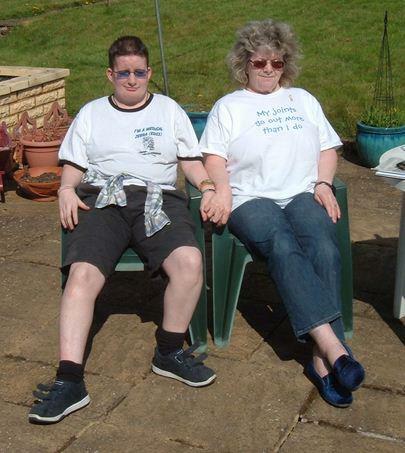 She mentioned it looked like I may have Ehlers-Danlos Syndrome. When I got home I researched it loads. I went to see my GP regarding getting an appointment with the Geneticist. I went to appointment with my parents (as only Dad can drive) & Mum & I were diagnosed as having EDS3 on the 11th December 2009. Mum does have it less than me. I'm now on Gabapentin & Amitriptyline & I'm reliant on at least 1 crutch when out & about. I have since tried to raise awareness, as other sufferers do. As not many people/Dr's etc... know about it. The 1-10 pain scale (10 being worst pain ever) is useless with me & Mum (who also has EDS 3). On a bad day we normally would put it at more of a 15-16 (TOTAL agony). On a good day we are usually at about 8-9. Some days are really bad, often don't really want to get out of bed in the mornings. You may also get regular 'Brain Fog'. Brain Fog is common in EDS sufferers etc.... I often forget PC type stuff now, luckily not when I've had a client over. You may have problems doing the simplest of things, like making a cup of coffee. You may forget the mug. Brain fog may be described as feelings of mental confusion or lack of mental clarity. It is called brain fog because it can feel like a cloud that reduces your ability to think clearly. It can cause a person to become forgetful, detached and often discouraged and depressed. Day to day you DON'T know how you will be, pain/fatigue/discomfort wise etc. 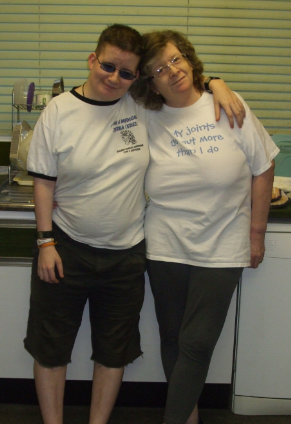 October 12th is World Arthritis Day - Also for those that suffer from EDS (wear your stripes on October 12th). As of August 22nd 2014 I've been put on Gabapentin. This has already given some normality back to my life. I can walk unaided more. I get better sleep & I'm in less pain. 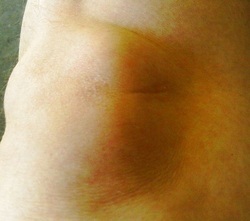 September - No Osteoarthritis in left hip. Pain, stiffness etc down to EDS pain alone. Having my dosage of Gabapentin upped until it works more effectively. The following PDF file is an 'Open Letter' which can be found online. I didn't write it, but it can be shared & put 'out there' etc..... It REALLY does cover what it's like to live with EDS. "When you hear the sound of hooves, think horses, not zebras." In medicine, the term "zebra" is used in reference to a rare disease or condition. Doctors are taught to assume that the simplest explanation is usually correct to avoid patients being misdiagnosed with rare illnesses. Doctors learn to expect common conditions. But many medical professionals seem to forget that "zebras" DO exist and so getting a diagnosis and treatment can be more difficult for sufferers of rare conditions. 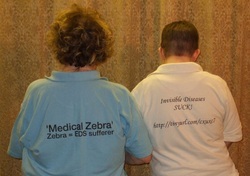 Ehlers-Danlos Syndrome is considered a rare condition and so EDS sufferers are known as medical zebras. This identity has now been adopted across the world through social media to help bring our community together.  The Zebra print in the form of i.e. suitcase/blanket/tie etc... is a tell-tale sign of a sufferer. On EDS Awareness Day (Oct. 12th) & during EDS Awareness Month (May) we raise awareness by wearing our stripes, some type of Zebra print/Zebra logo etc.... The Zebra is very important to us. The Ehlers-Danlos Syndrome awareness pin is Zebra stripes. There are many supportive groups on i.e. Facebook & via www.ednf.org/support-groups etc... You can also find fellow sufferers via the Ehlers-Danlos Registry. My camera's a bit useless, so some pics may not be too great. These DO ALL (except Scars) result in a great deal of pain 24/7. 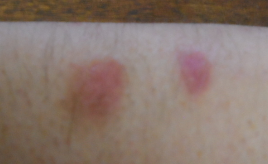 November 2014 - (Right arm) Scars from 2 recent EDS sores that took several months to heal.